The highly elastic Leukoplast Elastomull Elastic Bandage 8cm x 4m (Pack of Two Rolls) provides flexible support for wound dressings, specifically for joints and other areas of the body that experience frequent movement. The quick and easy-to-apply elastic bandage is soft and gentle on skin, offering comfort and protection. 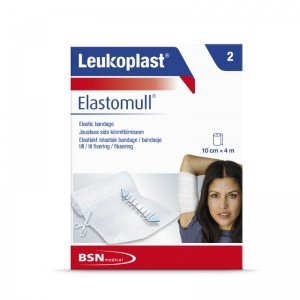 The Leukoplast Elastomull Elastic Bandage provides soft, gentle support for wound dressings. Soft on the skin while providing extreme flexibility, the elastic bandage offers comfort in protecting and dressing wounds and injuries. The Leukoplast Elastomull Elastic Bandage 8cm x 4m (Pack of Two Rolls) is usually dispatched via First Class Royal Mail and delivery should be within 1 to 3 working days.